UCLA has agreed to host the annual conference for Students for Justice in Palestine, a radical student group that leads much of the anti-Israel campus activity at universities across the country, the Jewish Journal reports. 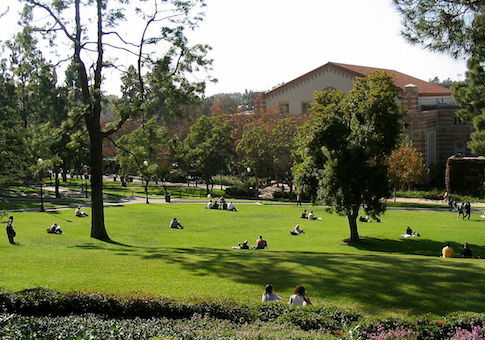 UCLA has been under pressure to back out of hosting the group given its history of disrupting Jewish events on campus and promoting movements such as the Boycott, Divestment, and Sanctions (BDS) campaign, which aims to destroy Israel through economic warfare. In its statement, the university said that it opposes the BDS campaign, but still feels obligated to host the event. "Use of campus space by a student organization such as Students for Justice in Palestine (SJP) does not mean that UCLA endorses the event or agrees with the views expressed by the event organizers," the university said. "For example, UCLA and the University of California Regents continue to firmly oppose boycott, divestment and sanctions (BDS) against Israel." "Especially in a university setting, controversial topics should be discussed thoughtfully and respectfully, free from demonization, insult or ethnic bias. UCLA holds participants at campus events organized by registered student groups to the standards of behavior set forth in the UCLA Student Code of Conduct and applicable laws, and is committed to ensuring the safety of all of our students." Pro-Israel groups critical of UCLA's decision point to SJP's disruption of campus events held by groups supportive of Israel earlier this year. The Israeli-American Council criticized the decision in a press release, saying the school was putting the safety of its Jewish students at risk by agreeing to host a group openly hostile to Israel's existence. "It doesn’t take a genius to connect the dots: this group encourages anti-Semitism," the group's executive director said. "This conference for hate threatens the 10,000 Jewish students currently at UCLA. The UCLA leadership should be ashamed for hosting this vile, hateful group." SJP brags on its website that it has successfully disrupted numerous campus events, which was enough for one UCLA professor, Judea Pearl, to urge the university to change course. "The organization in question as a matter of its own policies violates university protocols and hampers free speech of others as a strategy," Pearl wrote in a letter to university officials, pointing to SJP's listed accomplishment of disrupting "pro-war, Zionist, and racist guest speakers"
"SJP is here boasting about, and suggesting a continuation of the disruptive tactics it adopted in the past year," Pearl wrote. "This organization which attacks Zionism as racism itself uses the most racist and vile language and violates the basic norms of civility on campus," Pearl wrote. "It is a destructive organization that is committed to sowing discord and uses the campus as a locale to advance its radical political aims which is not a negotiated and peaceful settlement of an historic conflict but rather the de-legitimatization and the destruction of the State of Israel." The conference is scheduled to take place in November. This entry was posted in Issues and tagged Anti-Semitism, College Campuses, Israel. Bookmark the permalink.